One of the most popular Photo-Sharing site, Flickr, announced a new feature which lets you find Flickr users or friends. Flickr made a move to maintain the popularity as to follow with the on-going social trending market. Facebook’s popular ”People You May Know” feature, has been adopted by the photo-sharing site which serves as the friend finder/recommendation service. After the success of this feature in Facebook, Flickr is now proudly using this powerful way to find mutual friends and connections, even though late but better than never. This new feature can be accessed via the sidebar of the Flickr homepage or from the new Find your Friends page. Along with adding this great new feature, Flickr has also added Facebook to its list of services with lets you cross-check for your friends and contacts. 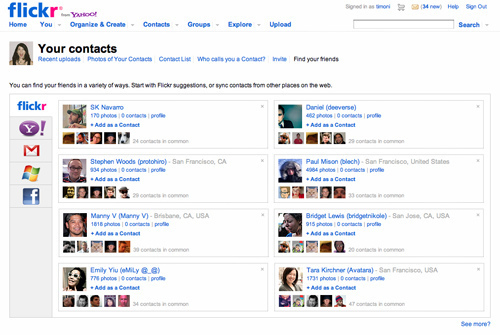 Flickr already allows users to find contacts and friends via Gmail, Yahoo Mail or Hotmail but integrating Facebook makes Flickr look more cool. The feature also lets users hide them by preventing their name to come up as a suggestion . If you don’t want to act social, all you need to do is adjust the existing settings by clicking ”hide your profile from public searches”.